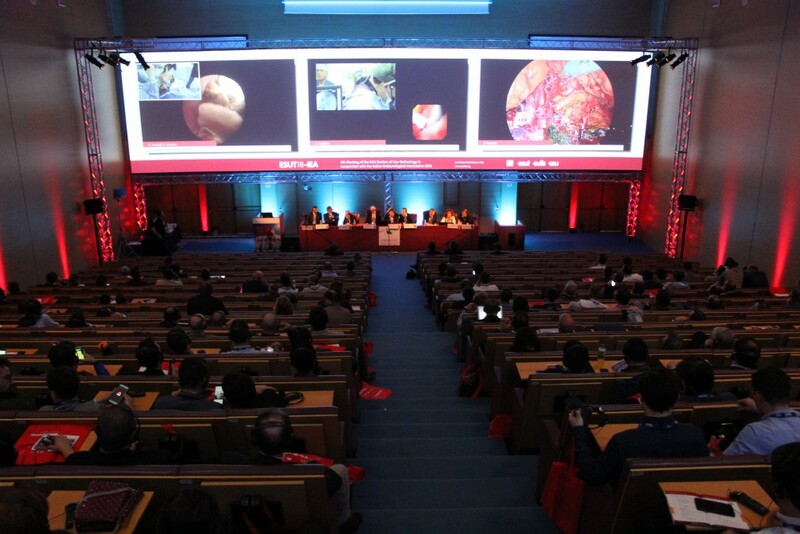 The first day of ESUT18 marked the beginning of a three-day meeting that aims to give its participants the best of new surgical technology in urology. The 6th Meeting of the EAU Section of Uro-Technology (ESUT) joined forces with the Italian Endourological Association (IEA) in Modena, Italy to accomplish this feat. The meeting started with a welcome from Profs. Liatsikos (GR) and Bianchi (IT) on behalf of both societies, as well as Modena mayor Mr. Gian Carlo Muzzarelli. As the three (!) operating theatres made preparations for the simultaneous broadcast, Prof. Roberto Miano (IT) updated the audience on the SimBase project, in which the Italian Society of Urology takes part. SimBase uses simulators for training urological procedures in a standardized manner, yielding a variety of advantages over more conventional “see one, do one, teach one” principles. The aim of SimBase is to offer a standardized and centralized simulation-based training supplement to the local residency programme. It is focused on basic laparoscopy and basic upper tract endoscopy. The SIU has settled on renting 12 Pro-Lab v2 Trainers (appropriately enough, for a meeting in the carmaker’s hometown of Modena, described by Miano as “the Ferrari of trainers”), and lending them out in five month periods to resident training centres. This allows training at 24 venues in one year time. The lessons will be measured according to a performance improvement score and culminate in participation in the EAU’s E-BLUS exam at the annual SIU congress. One of, or perhaps the single most important part of the ESUT18-IEA meeting is the live surgery. All stops were pulled out in Modena, offering audience not one or two live feeds, but a three-way simulcast. The audience was equipped with headsets to be able to follow the procedure of their choice. Each procedure was also separately moderated by a team of experts. As the live procedures followed their course and the patients were ready to leave the OR, interesting pre-recorded cases were also shown in each “channel”, presented live. Dr. Daniele Panarello from Genoa (IT) was one of the co-moderators of the procedures shown on Screen 1, and had closely followed the PCNL.